Finding the area of a circle is not as easy as finding the areas of triangles, parallelograms, and trapezoids. The circumference of a circle is curved, and it is not easy to fit squares in the bounded region. Knowledge in calculus is required to prove the circle’s area formally, but in this post, I will discuss a more intuitive way of understanding why the area of a circle with radius is . If we divide the circle into congruent sectors, we can form the figure above. In the figure, the circle is divided into 6 equal sectors which means that each of the central angles is equal to . 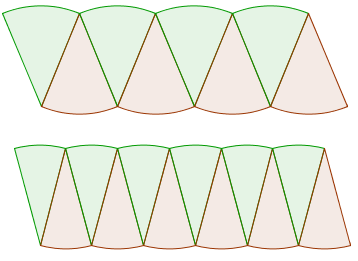 The second figure shows a circle divided into 8 and 12 parts, respectively. Notice that as the sectors become smaller, the outermost radii of the sectors becomes steeper. This means that the shape is becoming more and more like a rectangle if not a parallelogram. If so, its area is the product of its base and its height. Since the circumference of a circle is the base is (Can you see why?). Clearly, the height is . Therefore, the area of the rectangle or parallelogram is equal to . In theory, we can divide a circle into as many sectors as we can. In calculus we say that as the number of sectors increases without bound (approaches infinity), the shape approaches the shape of the rectangle.